Details have emerged about a flat Salman Abedi is said to have been using in Manchester until about six weeks before his suicide attack. A friend of Abedi’s landlord claims the bomber left behind a flat that smelled of chemicals and he had crossed-out children’s stickers on the walls. It appeared the window had not been opened in two months, the friend said. The landlord was in tears, he added, when he realised from the news his tenant had carried out the attack. 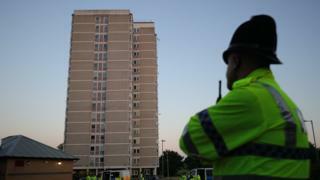 The friend claimed Aimen Elwafi decided he would have to tell the police, despite having breached the terms of his tenancy by subletting to Abedi. Mohammed El-Hudarey told the BBC that Abedi had answered an advert three-and-a-half months ago. He wanted to move in to the apartment in a tower block in the suburb of Blackley for two months. Abedi said he was a student who worked at night as a delivery driver. Mr Elwafi had received a call late at night, about a month-and-a-half ago from Abedi, who said he would be moving out because he was “flying abroad”. When Mr Elwafi arrived at the flat an hour later, Abedi was gone, the friend said. He found squares of curtain-like material cut up, a metal rod in the bath, a chemical smell, the electricity turned off and a smoke alarm disconnected, Mr El-Hudarey said. Abedi had used a pen to cross out children’s stickers on the walls of the flat. Mr El-Hudarey said Abedi seemed to believe they were forbidden by Islam. He said bed clothes for more than one person were in the flat, and when the rental had been agreed, a younger man had been with Abedi. After the bombing, Mr El-Hudarey recognised the name Salman Abedi in news coverage and told his friend, who checked pictures obtained by the media and realised what had happened. He immediately called the police. A 38-year old man has been arrested and remains in custody.